This buyer’s guide will help you work out what type of reverb pedal will be the best for you. I will explain what options there are, what features to consider and whether a pedal may or may not suit you. By the end you will know exactly how to find the right reverb pedal for you. There are so many reverb pedals available today that it can be overwhelming trying to find the one right for you. There are quite a few different types of reverb effects available and each give a very different sound. Some reverb pedals even mix in different effects in the one pedal such as delay or modulation. Spring reverb is where a long metal spring vibrates and a pickup captures that vibration. It has a very distinctive sound and if you shake the spring reverb device you can usually hear the metal spring shaking. 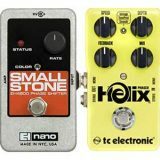 Most pedals that offer room or hall reverb allow you to control the size of the room to achieve anything from a small subtle effect all the way to a massive church like reverb. The pedals I will cover in this guide are all digital pedals. Digital pedals produce excellent reverb effects. Just keep in mind that if you’re looking for the best spring reverb pedal for a vintage sound, you might want to look at devices that actually use a spring to produce the reverb. As most guitarists prefer the convenience and practicality of stompboxes, I won’t cover analog spring reverb pedals in this guide. To learn more about the different types of reverb (along with every other effect type), check out the Guitar Effects Course here. This is an important feature to consider as not all reverb pedals are stereo. As the reverb pedal is often one of the last effects in a guitarist’s effects chain, whether it is stereo or not will impact your entire signal chain. If you don’t want to run a stereo rig, then you don’t need to worry about this. But if you do run a stereo rig or might in the future, you will need a stereo reverb pedal. Take a look at your current pedals and how many are stereo. This should give you a good indication on whether you might want to get a stereo reverb pedal. So if all of your pedals are mono, then it’s not going to impact you. But if you have a stereo delay pedal, stereo chorus or any other late in your signal chain, consider getting a stereo reverb pedal. Whether the reverb pedal you choose uses True Bypass, a buffer or allows you to switch between the two is important – more than other types of effect pedals. Remember that reverb creates a sound that trails off even after you stop playing (similar to delay). If you have a reverb pedal that uses True Bypass and you hit the bypass footswitch as the reverb trails off, it will cut the effect off before it naturally fades away. It’s very jarring to hear a reverb cut out all of a sudden. So while True Bypass is usually recommended with other types of effect pedals, it can create a problem with reverb. Alternatively, when a reverb pedal uses a buffered bypass, this problem doesn’t apply. The reverb will continue to naturally trail off after you hit the bypass footswitch. If you plan on having your reverb pedal active all the time, then this isn’t an issue at all and True Bypass won’t cause a problem. But if you plan on only using reverb at certain times and will be turning it on and off regularly, then keep this in mind. There are countless reverb pedals available today and it’s impossible to pick out the best one. Instead, I’ll split them up into different categories you might want to think about. In each category, I’ll give a pedal that’s worth looking at if that category fits your needs. The pedals I list below are all excellent quality and highly recommended. But as I’ve mentioned, there are countless reverb pedals available so use my suggestions as a starting point and if you find another pedal that meets your needs, then that pedal is the best for you. This is a buyer’s guide so use it as a guide. As you will see in the reverb pedals later, there are a lot of different features that can be crammed into a reverb pedal. 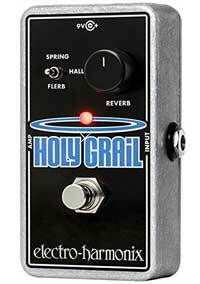 The Holy Grail Nano by Electro-Harmonix stands out as one of the simplest reverb pedals you can get. It has two controls: a knob to control the level of reverb and a toggle switch to choose between three reverb types (spring, hall, ‘flerb’). The Flerb mode is a combination of reverb and a flanger which can produce a very unique tone when used at the right time. Check out the Holy Grail Nano here for pricing and full details (link to Amazon). 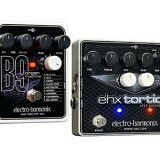 This was a hard choice between the BOSS RV5 and the Hall of Fame Reverb by TC Electronic. Both offer a similar set of features and both are extremely popular. The RV5 has been around for a long time and has stood the test of time as an excellent reverb pedal. The reason I recommend the Hall of Fame for this category is that it contains more modern features. The RV5 has 6 different modes while the HOF has 11 modes. Those extra modes give you the ability to find the perfect reverb type for any song you want. As with all modern TC Electronic pedals, the HOF also has the TonePrint feature which allows you to tweak and customize your own preset. I also feel this would be the best reverb pedal for acoustic guitar. With acoustic guitar, the ability to tweak your effects to just the right level can make or break your overall tone. 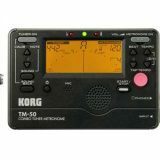 As this is a stereo pedal, it would also suit acoustic guitarists looking at producing a wide sounding stereo tone for gigs. The modulation effects mixed in with some of the reverbs could help you craft a unique tone most other acoustic guitarists wouldn’t think about. 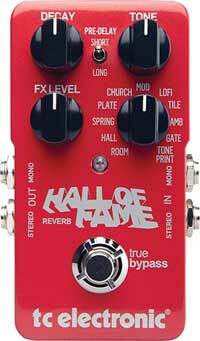 If you’re looking for a reverb pedal for acoustic guitar, I recommend the Hall of Fame Reverb. Check out the Hall of Fame pedal here for pricing and full details. 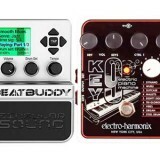 If you want the best quality reverb pedal available and don’t care about the cost, there are two choices worth considering: BigSky by Strymon and Space by Eventide. Both pedals are highly praised and have a large following of guitarists who use them. I recommend the Eventide Space as the best in this category as it has a few advantages over the BigSky. But either pedal can produce amazing results. I also feel the Eventide Space would be the best reverb pedal for ambient sounds. The ability to store countless presets and mix and match different effects allows you to create anything from lush soundscapes to unusual or quirky effects. While some of the other reverb pedals here might be suitable for ambient sounds, the Eventide Space gives you much more flexibility, quality, and tweakability. 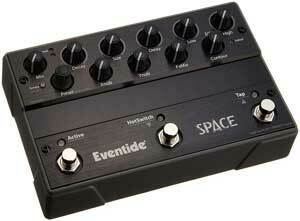 Check out the Eventide Space pedal here for price and full details. 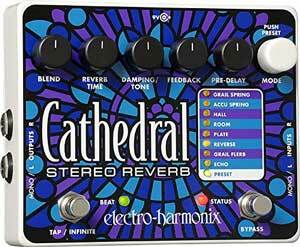 The Cathedral by Electro-Harmonix is an excellent quality reverb pedal. While it may not be on the same level as the Space of BigSky pedals above, the reason this pedal stands out is that it’s less than half the cost of those pedals. That means the Cathedral gives you excellent quality reverb at a much lower cost than what you would pay for the Eventide Space. Check out the Cathedral pedal here for price and full details. Most of the pedals above are around $120 and when you consider the features packed into those pedals, they’re definitely worth the money. But if you want to buy a reverb pedal under $100, there are a couple of options out there. The pedal I recommend is the Hall of Fame Mini by TC Electronic. It’s an incredibly simple pedal with one knob controlling the reverb level. The reason this pedal stands out is that you still have access to the TonePrint feature which means you can still load essentially any type of reverb you want onto the pedal. That feature alone makes it stand out over all the other reverb pedals under $100. 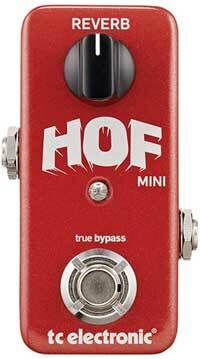 Check out the HOF Mini pedal here for price and full details. EarthQuaker Devices Afterneath V2 – if you’re looking for a unique pedal that produces effects a standard reverb pedal won’t produce, the Afterneath is worth checking out. 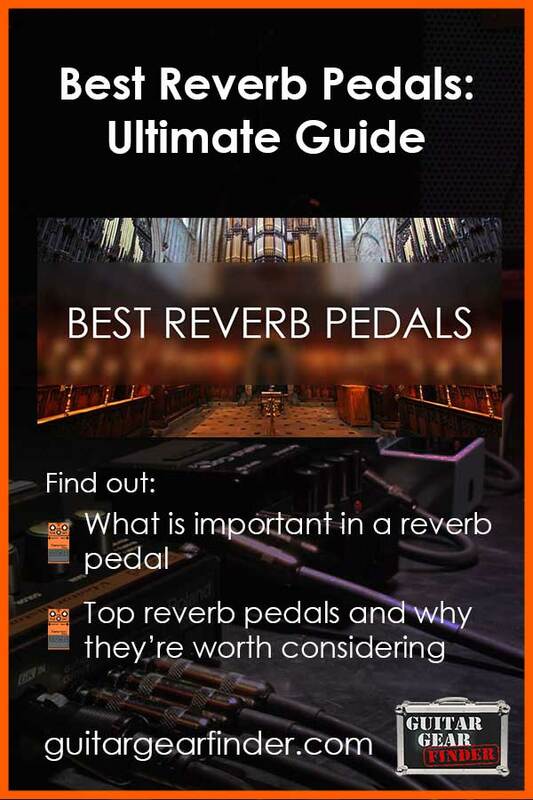 As I mentioned at the start of this guide, there are countless reverb pedals out there. It’s very easy to get lost in all the features and brands so sticking to the pedals listed here will help you save a lot of headache.